So far, only 2 LMLK ostraca (i.e., inscribed pottery fragments) have been found, one incised/scratched found at Tell Qasile, & another written in ink recovered from Lachish. 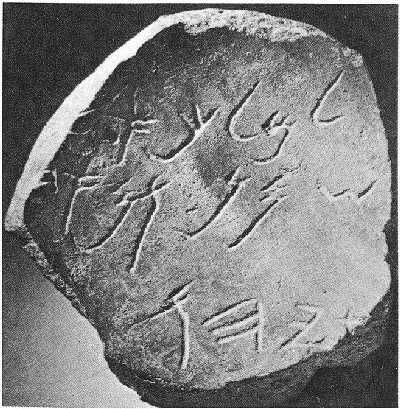 Note: In the 1997 book, "Corpus of West Semitic Seals", editor Benjamin Sass questioned the authenticity of this & another inscribed ostracon found on the surface by Dr. R. Hoff the following year (May, 1946) because of an obviously forged seal found with it, & a similar seal bought in Jerusalem that is now at the Israel Museum (#68.35.193). 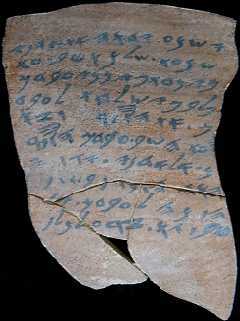 It may be that this LMLK ostracon was genuine, & prompted someone to forge the other artifacts the following year; or the LMLK ostracon may have been forged in 1945 to draw attention to the site. Benjamin Maisler excavated the site from 1948-1950 & did not recover any epigraphic material. Harry Torczyner, 1938, "Lachish I (Tell ed-Duweir), The Lachish Letters"
David Diringer, 1953, "Lachish III (Tell ed-Duweir), The Iron Age, Text"
Andre Lemaire, 2004, "The Renewed Archaeological Excavations at Lachish Volume IV"